This fast garlic shrimp dish is tossed with angel hair pasta in a simple butter sauce with some red pepper flakes and parmesan. Clean flavors and ready in about 20 minutes! To prep the shrimp, peel the shells off and remove the tails. If the shrimp aren’t cleaned, run a paring knife down the back of each shrimp and rinse out any of the dirt in the shrimp vein. Toss shrimp with 1 teaspoon olive oil and 1 clove minced garlic. Let sit for a few minutes. In a large skillet over medium heat, add olive oil and pre-heat. When oil is hot add shrimp and cook for 1-2 minutes per side until the shrimp are mostly cooked through. It’s okay if they are still slightly pink in the center. Remove shrimp from skillet. Meanwhile, cook angel hair according to package instructions in salted water. See my how to cook angel hair pasta tutorial for perfect pasta. Add butter to skillet along with sliced garlic and a pinch of red pepper flakes. Cook for a minute in the melted butter, being careful not to burn garlic. Add white wine and use the liquid to scrape up any bits stuck to the pan. 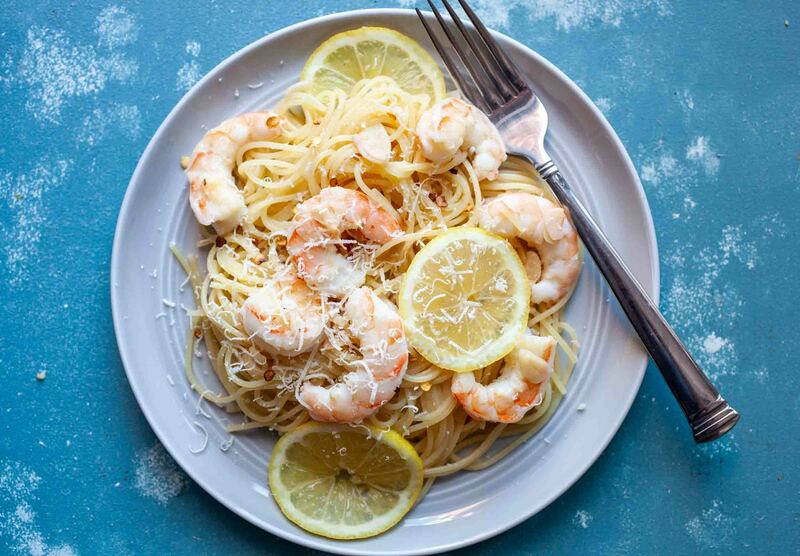 Squeeze in lemon juice and return shrimp to the skillet. Toss to combine. Pull angel hair straight from the pot and add to the skillet. Toss to combine and season with salt and pepper. Add 1/2 cup pasta water from cooking to help with sauce. Toss to combine. Serve pasta immediately garnished with parmesan cheese and a pinch of red pepper flakes. This delicious recipe was brought to you by Macheesmo. Read the full post at https://wp.me/pkSYO-gvW.